To facilitate collaboration in emerging domains such as the Patient-Centered Medical Home (PCMH), the authors' prior work extended the NIST Role-Based Access Control (RBAC) model to yield a formal Collaboration on Duty and Adaptive Workflow (CoD/AWF) model. The next logical step is to place this work into the context of an integrated software process for security engineering from design through enforcement. Towards this goal, the authors promote a secure software engineering process that leverages an extended Unified Modeling Language (UML) to visualize CoD/AWF policies to achieve a solution that separates concerns while still providing the means to securely engineer dynamic collaborations for applications such as the PCMH. This Section presents the two main background work our chapter is based on. 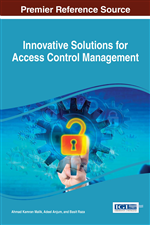 In particular, this includes the work on integrating access control into UML as well as the concept of CoD/AWF. To better illustrate our work, this section includes a health care scenario which will be re-used throughout the remainder of this chapter.